Diana West’s seminal and exhaustive exposé of FDR’s betrayal of the U.S. deserves revisiting and re-reading by anyone who wants to grasp why the U.S. is now incrementally submitting to and allowing the invasion of this country by Islam.. This is the original Rule of Reason review, with some minor corrections, from June 8th, 2013. In American Betrayal *, Diana West begins in 1933. In the name of establishing historical causo-connections, I would have begun in 1781, when Prussian philosopher Immanuel Kant published his Critique of Pure Reason, a brain-cracking treatise which relied on reality to prove that reality was unknowable. That is, by reading his book, a real thing in your real hands, you were expected to agree with Kant that real things were only rough reflections of entities whose "essences" he claimed existed but were invisible beyond the evidence of our benighted, warping senses, in some other realm (theoretically beyond his own). Kant counted on everyone not noticing the contradiction and not seeing the ease with which his elaborately constructed mare's nest could be exploded. No contemporary, I gather, ever directly accosted Kant and said, "Herr Professor! If what you say is true, then this book is just a shadow, and the print in it, and all your words, too! What could they mean? How could they be true? Are your words noumena, or mere phenomena?" Are they non-perceptual things, or are they mere sensory data? But no one ever did confront Kant with his contradictions, fallacies, and cerebral legerdemain, except for some Hegelian hair-splitters – such as Arthur Schopenhauer in 1818 in his own obtuse work after Kant’s death in 1804 – and the Western world has been hugely the worse for it. Kant was an enemy of the Enlightenment. Diana West, among her other arguments, contends that the political and intellectual leaders of the West by 1933 had abandoned reason and all Enlightenment ideas. Nay, with very few exceptions, they became as hostile to them as Kant ever was. West begins in 1933. Of what significance is that year? Adolph Hitler became Chancellor of Germany and Reichsstatthalter of Prussia on January 30th, 1933. From August 1934, he would be Führer of Germany until his suicide in April 1945. Democrat Franklin D. Roosevelt became the 32nd president of the United States on March 4th, 1933. He would remain in that office until his death in April 1945. Because the Communist régime was so openly and ideologically dedicated to our destruction, the act of recognition defied reason and the demands of self-preservation. Recognition and all that came with it, including alliance, would soon become the enemy of reason and self-preservation…. In short, the U.S. government had by 1933 lost the capacity for making moral judgments. It cringed like a coward when asked to make one, and hissed and spat like a rabid animal at the mere suggestion of it. It still does when the subject of Islam comes up. Recognition of the Soviet Union not only granted the murderous Communist dictatorship a moral sanction, it also opened the gates to the wholesale Soviet infiltration and subversive activities of its agents, American sympathizers or "fellow travelers," and members of the Communist Party USA. The Soviets never honored any of the terms of that recognition. The precedent had been set. We can see the insidious parallels today in our government's refusal to withdraw moral sanctions from Islamic régimes and its tolerance of terrorist-founded and terrorist state-funded organizations like the Council on American-Islamic Relations (CAIR) and the Muslim American Society (MAS) within our own borders. In March 1933, Harry Hopkins, a veteran of former New York Governor Roosevelt's welfare programs, on Roosevelt's invitation joins the new administration, at first running the Federal Emergency Relief Administration (FERA), the Civil Works Administration (CWA) and the Works Progress Administration (WPA). In this pre-war period he also established the National Youth Administration (NYA) and the Federal One Programs for artists and writers. In May 1940, Roosevelt makes Hopkins his first counsel in all matters pertaining to Europe and the new war. Hopkins moves into the Lincoln Bedroom at the White House, his office and residence for the next three and a half years. Hopkins not only advises Roosevelt on foreign policy and war issues, but directs Lend-Lease, a program conceived by Armand Hammer, a notorious Sovietaphile, ostensibly created to aid the British in their fight against the Nazis, but actually intended to aid Josef Stalin and the Soviet Union. Between 1932 and 1933, millions of Russians starved to death as Stalin's government confiscated harvests in the brutal forced collectivization of Russian agriculture. Millions more would perish over the decade from starvation, from being sent as slaves in the Gulag, in mass executions, and in political purges. Dennis J. Dunn agrees with historian David Mayers, who has argued that the failure of the U.S. government under Roosevelt to reckon with the profound crime of the Terror Famine in negotiations over recognition made it – us – "a passive accomplice to Stalin in the Ukraine." Diana West steps up to lectern and confronts Professor Kant with some very incisive and inconvenient questions of her own. Who really won World War II? Was it really America's "Good War"? Did the "greatest generation" fight to rid the world of one toxic dictatorship only to enable another to take its place? How is it that the only beneficiary of that war was the Soviet Union, which acquired an Eastern European empire? Were Americans conned, scammed, and robbed throughout the government-perpetuated Depression and then during the war? Who was really establishing American foreign policy in the 1930's and 1940's: Roosevelt, or Stalin through Harry Hopkins, who had Roosevelt's ear 24/7, and countless Soviet agents and traitors embedded in our government dedicated to selling secrets, altruism, self-sacrifice and welfare statism? 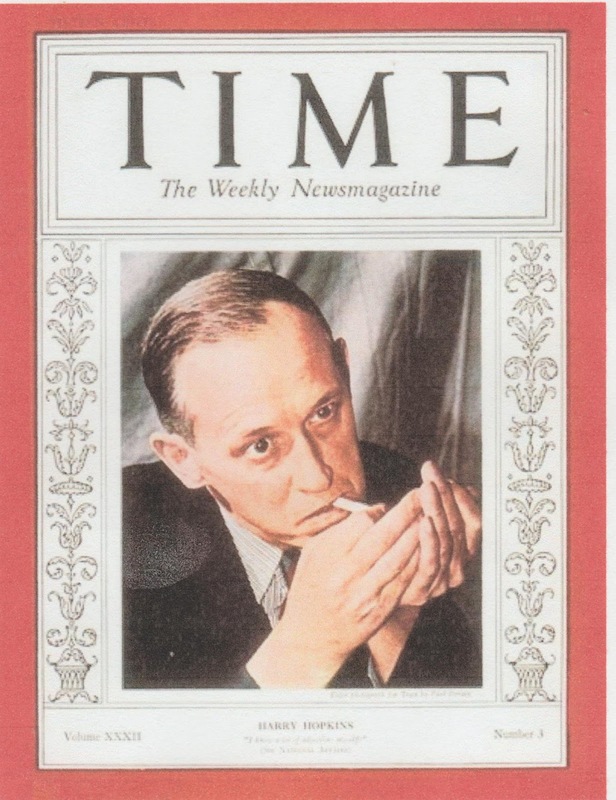 Hopkins, West suggests, was the Soviets' most important agent in the U.S. government. Whether or not he was "recruited" or "co-opted" by the Soviets, or was a volunteer agent, West was not able to determine with certainty. He is referred to in Soviet cables as "Agent 19." The KGB boasted that he was the Soviet Union's "most important agent." West performs a yeoman's task and gets to the "essence" of that whole sorry and tragic period, proving in her narrative that the reality of our relationship with the Soviets is knowable, and moreover, that its "essence" was ugly, scary, and shameful. I would add, pertaining to all the actors in that period responsible for what West calls the "Big Lie," criminal and treasonous. What precedes and follows West's statement is not for the weak of stomach or faint of heart. With a meticulous and excruciating fealty to the truth, and after exhaustive and often frustrating research (because many documents that once existed and that were evidence of the government's complicity were destroyed or had simply vanished from government archives), West paints a picture of not only FDR's complacency and duplicity towards Soviet totalitarianism, but Harry Hopkins's contribution to the fall, as well, in addition to that of a legion of liars, fabricators, Communist moles, agents, and spies who then populated government positions, just as an underground state now populates the Trump administration and influences Trump’s policies. If you think the Benghazi cover-up is a classic case of desperate political back-pedaling, official lies and semi-lies, face-saving, and walking away from reality, that episode is merely a miniature of the colossal con pulled on the whole country by Roosevelt and his minions from 1933 onward. West covers several main subjects, among them the extent of Soviet espionage against the U.S. and the extent of Soviet infiltration in our government, an infiltration so common and ubiquitous in numerous Depression Era and wartime agencies that the government was literally top-heavy enough to cause the ship-of-state to list ever Leftward. The government was so saturated with lefties and Communists that they became the de facto architects of domestic and foreign policies. 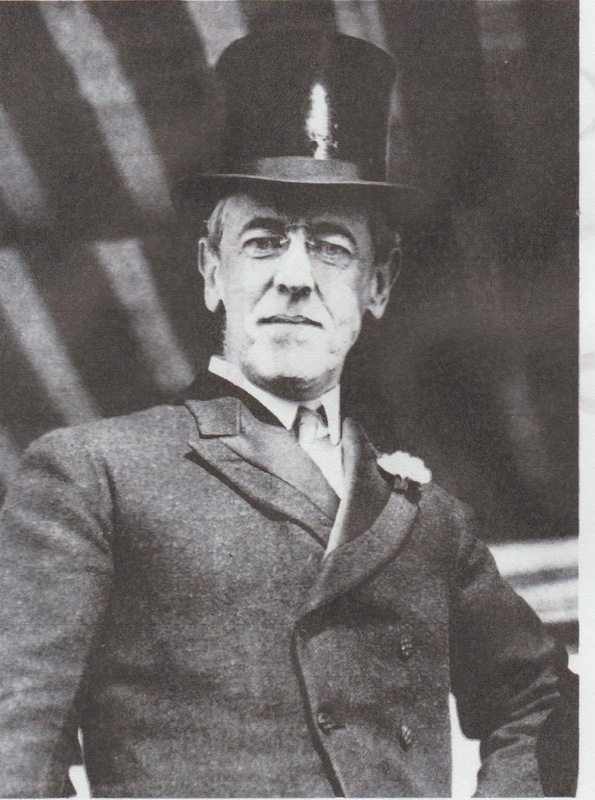 West dates the beginning of the end of a fairly solid and reclaimable constitutional republic – reclaimable from Wilson's Progressive precedents of a central bank, the income tax, and becoming the world's moral policeman, moves which put the country on the road to incremental serfdom – from 1933, when the U.S. recognized the U.S.S.R. as "just another system of government," not much different from our own. 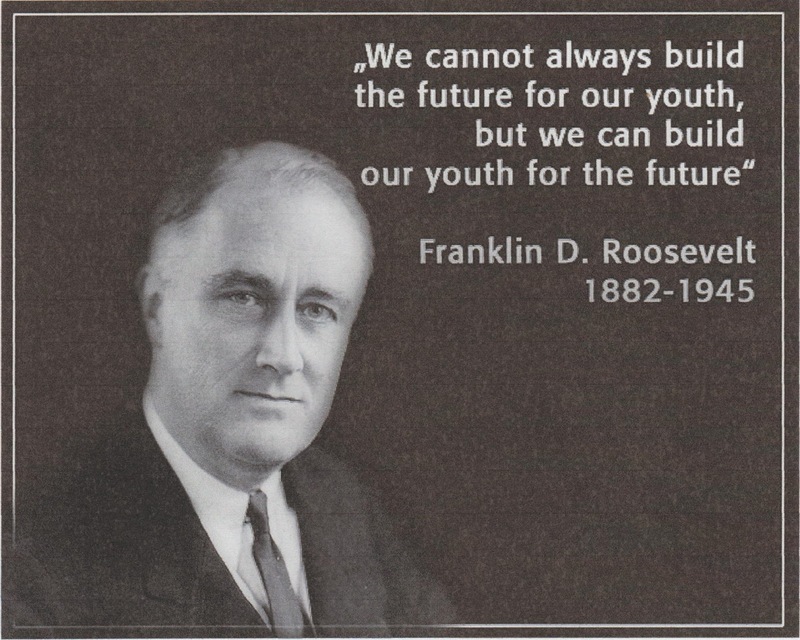 Roosevelt, West explains, believed in the "convergence" of our system of government and that of the Soviets. Aside from buttressing his collectivist programs of the New Deal welfare state, the "convergence theory" enabled Roosevelt to be essentially an apolitical pragmatist. There was…one point of ideology that Roosevelt does seem to have fervently embraced, which historian Dennis J. Dunn believes made him an ideologue after all. FDR, Dunn writes, seized on the theory of "convergence" as it applied to the United States and the USSR, the idea being that capitalism and Communism would take on enough characteristics of the other to "converge." There's that Hegelian/Marxist "dialectical" evolutionary force that was somehow ineluctably moving both sides toward "convergence" so that, to the casual observer, when the melding occurred, there wouldn't be a dime's or kopek's worth of difference between the two countries. Human volition and action would have nothing to do with it, neither in acts of Congress nor in executive branch decrees nor in Supreme Court decisions. "Convergence theory" assumed the cognitive powers of a somnambulist. It would "just happen." Don't blame us, counter the advocates of that theory and others. We have nothing to do with it. It's just "history." Worried that a Nazi attack on the Soviet Union would jeopardize his interests in the Soviet Union (and no one in Washington believed the German-Soviet non-aggression pact, signed on August 23rd, 1939, would last), he met with Roosevelt in the White House on November 28th, 1940 and sold the president and Hopkins on the idea of establishing a government entity that would be responsible for aiding the British in their war with Germany (Hopkins later claimed the idea came to him out of the blue), but would actually help Stalin prepare for the expected abrogation of the "non-aggression" pact and enable him to withstand the invasion with American help. It should be noted that this "pact" prepared the way for the co-invasion of Poland by both the Nazis and the Soviets on September 1st, 1939, the spark that began World War II. Both regarded the pact as a temporary truce (in Islam, a hudna contrived to buy time); Stalin wanted to eventually conquer Europe; the Nazis drooled over the oil fields of Baku and the prospect of endless lebensraum. Armand Hammer, who died in 1989, was a walking exemplar of the political "convergence" subscribed to by Roosevelt, a Republican who contributed to Richard Nixon's 1972 presidential campaign, and was a frequent visitor to the White Houses of Presidents Reagan, Carter, and George H.W. Bush. He had met and was on friendly terms with every Soviet dictator but Stalin. Hitler signed the first operational directive to invade the Soviet Union on December 18th, 1940. West details just how much Lend-Lease aided the Soviets. When the U.S. finally entered the war on December 7th, 1941, Hopkins and Lend-Lease gave aiding the Soviets the first priority in planes, tanks, small arms, munitions, Liberty ships, military machine parts, and other materiel, including food, clothing, medical supplies, etc. – over the U.S.'s own warfighting needs. While Americans had to make do with rationed sugar, butter, meat, tires and gasoline, the Soviet government received these things free, without condition, and without interest (on a "loan" which was not expected to ever be paid back by the Soviets, and never was). The Navy and Army had to wait until Soviet quotas were filled before being able to take delivery on their own weaponry and supplies. West devotes many pages to how the Office of War Information, staffed and controlled largely by Communist Party members, contributed to the white-washing of Soviet Russia, to make "Papa Joe" Stalin and his dictatorship palatable to the American public. Aiding them in this propaganda and agitprop were the press and broadcast luminaries. The overall mantra was: Stalin and Russia were the "good guys," put upon by the "bad guys," the Nazis. Stalin and his régime never did a bad thing, they just had a "different" political system, which shouldn’t be judged because of the millions it wiped out of existence (those millions never mentioned). This effort ranged from standard pep-talky government propaganda to wartime newsreels to Hollywood movies. The standing orders from the OWI especially were that in no instance was the totalitarian nature of Soviet Russia ever to be revealed, discussed, or even insinuated. Why pretend, indeed? Because the government didn't want to risk alienating Americans from the war effort. It wouldn't be good for "morale." They might stop buying War Bonds, and demand an end to rationing. They might object to being in league with a devil that wanted to collectivize them, too. After Hitler and Stalin had devoured Poland in 1939, both went about "cleansing" Poland of its government and military elements, with the Nazis targeting Polish Jews. We are accustomed to watching videos of the Polish cavalry facing German tanks, but we are rarely informed that in the spring of 1940 the Soviets murdered between 15,000 and 22,000 Polish officers and policemen in Katyn Forest to remove any chance of the Poles resisting the Soviet occupation. Initial blame was put on the equally blood-thirsty Nazis, but it was the Nazis who discovered the mass graves after capturing that region from the Soviets, and who brought in several American and British POWs to see for themselves (hoping to put a chink in the American-Soviet alliance), among them Americans Capt. Donald B. Stewart and Lt. Col. John H. Van Vliet Jr. Stewart later testified before a Congressional committee about what he saw, and Van Vliet wrote two memos, one of which was put into an Orwellian memory hole – by Alger Hiss in the State Department. This information was relayed to Roosevelt, so he and Hopkins knew about the massacre. They suppressed the information. The country would not learn about it until 1950, when Stewart delivered his testimony. Russia would not confess to the massacre until 1990. Another issue that sent Diana West off on a wholly justified tear was the hypocrisy of the Nuremberg Trials, two sets of them between November 1945 and October 1946, with the U.S. conducting separate trials in its occupied zone in Germany. Two Soviet judges sat in judgment of their fellow killers, the Germans, alongside their American, British and French colleagues, and one Soviet chief prosecutor argued that justice be meted out to the Germans in the dock. The presiding Soviet judge, Major General Iona Nikitchenko, had previously presided over some of the notorious show trials in the1930's during the Great Purge. No one was supposed to raise so much as an eyebrow, if the ghastly details of Nazi depredations described during the trials seemed to resemble the ghastly details of Soviet depredations. The Soviets commit such crimes? Perish the thought. And thought did indeed perish. Stalin's insistence on a "second front"
The conduct of the war was more or less dictated by Stalin and adapted as necessary by Roosevelt and his Hopkins-picked general military staff, which included Generals Dwight D. Eisenhower and George C. Marshall. Stalin's idea was, first, to prolong the war as long as necessary, in order for the Soviets to better defend itself against the Nazis; and second, that the British and Americans should open up a "second front" by invading France. Winston Churchill, increasingly the odd-man-out in the triumvirate, argued fruitlessly to open up the new front by invading through the Balkans or through Italy, the better to cut off Soviet advances into central Europe. 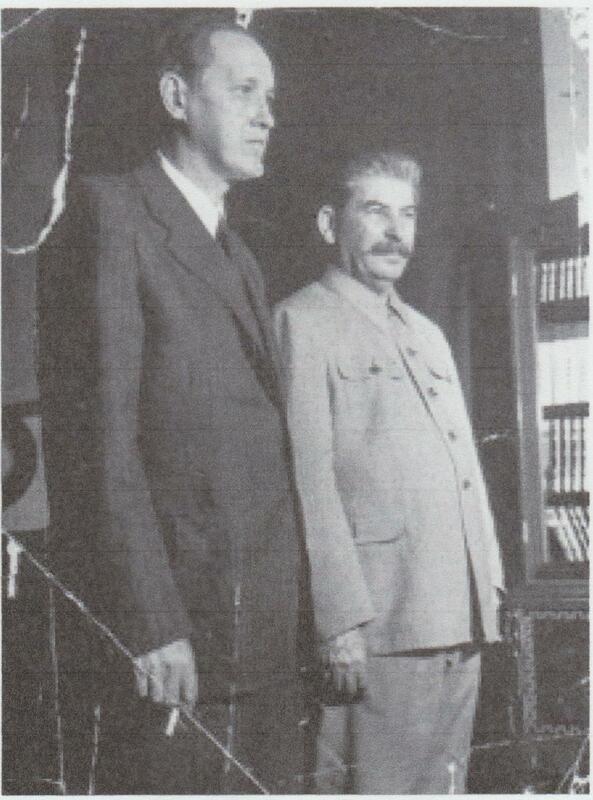 Unlike Roosevelt, he had no illusions about Stalin's master plan and motives. worthy of Hitler and Stalin. Of course Roosevelt's "fatalism" saved him the necessity of making a moral judgment. That was moral relativism at work, his "convergence" kicking in to relieve him of all responsibility for the certain misery and deaths that were sure to follow a Soviet occupation of Eastern Europe. Don't bother me, don't bother me. I don’t want to know. And so Eisenhower became Supreme Allied Commander and began planning D-Day. Integral to understanding why Stalin wanted his "second front" is West's revelations that not only was there an extensive German underground dedicated to ridding the country of Hitler and ending the war – an underground the U.S. refused to assist or aid in any way – but that Roosevelt, beholden to Stalin, rejected several overtures from high-ranking German officers to kill or incarcerate Hitler, establish a provisional, non-Nazi government, and sue for peace – but on the condition that German forces released from fighting the British and Americans be free to repel the Red Army from Germany and other regions then held by the Nazis. The war could have ended in 1943, long before the costly D-Day invasion through France in June 1944. Had that surrender happened, D-Day would never have taken place. It wouldn't have been necessary. Churchill, sympathetic to the idea, was helpless. Stalin wanted Germany reduced to rubble. The repatriation of Russians and Europeans to the Soviets by British and American forces, on order from Washington, was another shameful episode discussed by West, one not known to very many Americans. Ordering General Patton to stop his pell-mell drive so that the Red Army could take Berlin is a bit of history that hasn't been covered up. There is the issue of tens of thousands of American and British POWs in German camps being "liberated" by the Red Army and subsequently incarcerated in Soviet labor camps. There is one pre-war episode not mentioned by West but which has always stuck in my mind, one I read about long ago as a teen and which inaugurated my suspicions that WWII was not entirely conducted as I'd read in history books. This was story about the S.S. St. Louis, which left Hamburg, Germany in May 1939 with 900 Jewish refugees escaping Nazi persecution. After being turned away by Cuba, the ship called on Miami, Florida. No one was allowed to enter the country because of an annual quota on immigrants. After being rebuffed by the Canadians, as well, the ship sailed to Antwerp, where many of the passengers were taken in by Britain, Belgium, France, and the Netherlands. When the Nazis invaded the Continental countries, there was no escape for the remaining 620 passengers taken in by those countries. It is estimated that 254 of them died from one Nazi reason or another. My point here is that the U.S.'s ersatz immigrant quota system denied all those passengers a chance to survive and live. Today, we allow the virtually unlimited immigration of Muslims, and are contemplating allowing millions of illegal Mexican aliens, under the rubric of "amnesty," to remain here to better ensure a Democratic victory in 2016. This is a form of "convergence" not even Roosevelt could have contemplated or imagined. He opened the gates to one form of enemy; Obama and his minions continue to open them to another. 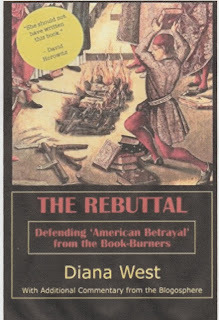 Diana West has done this country a favor by putting between two covers the record of a long, disgraceful period in American history. She will not receive very many thanks or compliments for having done so. She is likely to be reviled and smeared, when it is Franklin D. Roosevelt's person and record that should be reviled, together with the Soviets' top agent, Harry Hopkins. Moral and political relativism, she demonstrated, allowed the U.S. to tolerate the Soviets and their murderous totalitarian régime in the Red Decade, and then become an "ally" with it to crush a rival totalitarian régime, that of the Nazis. It inoculated Roosevelt, a political pragmatist with strong left-wing premises, against knowledge of the terrible and freedom-destroying nature of Communism, while, au contraire, at the same time allowed him and his agents to decry the terrible and freedom-destroying nature of Nazism. West's book initially began as an enquiry into why 9/11 was met with the government's ambivalence and delusions about the nature of Islam. Observing the inroads Islam and Sharia law were making in the U.S., she was certain that Islam was not so much a primitive religion as an all-encompassing totalitarian ideology, one as committed to conquest and slavery as had been Nazism, Communism, and Shintoism. If the government had raised the hue and cry about the evils of Nazism, why not about the evils of Islam? Because Roosevelt, Hopkins, and their allies in the State Department and other government entities practiced their own brand of uncritical "outreach" to Communism and the Soviet Union. Her search for an answer led her to discover and uncover, as far as the surviving records permitted her, all the lies and truths about Roosevelt, Harry Hopkins, Stalin, Communism, and the real reasons why the U.S. was drawn into a war whose only real victor was the Soviet Union. No hue and cry was ever raised by anyone in power about the evils of Communism, she discovered. Why not? And those few who did raise the hue and cry were mocked, smeared, marginalized, discredited, ignored, and banished from serious discussion. Why? What would permit our government, the leader of the "free world," to participate in and perpetuate the suppression of the truth about Communism and the Soviet Union, and to enlarge the area of the unfree world with an insouciant cry of C'est la vie? What would motivate it to con Americans year after year and throughout a devastating war? If our national character is defined as one of incorrigible individualism and freedom from fiat or arbitrary coercion, what had happened to it? These were the questions she sought answers to. One answer she learned, was that by 1933, our government had indeed reached another kind of "convergence," one in which truth and liberty met power-lust at a vector point and were demolished by a craving for power over men as a means of having power over reality, and that such power-lust would readily discard all principles and all commitment to upholding not just the Constitution, but the value of freedom. West does not go into the history of that growing power, which can be traced back to certain ideas and actions taken by men in government in the 19th and early 20th centuries to implement those ideas, and advocated by numerous groups, the most prominent of which were the Progressives. On one hand, the culprits did not value the truth. On the other, they feared its power and went to extraordinary lengths to suppress it, erected ideological barricades to block it from public knowledge, and punished those who spoke the truth or threatened to tell the truth. 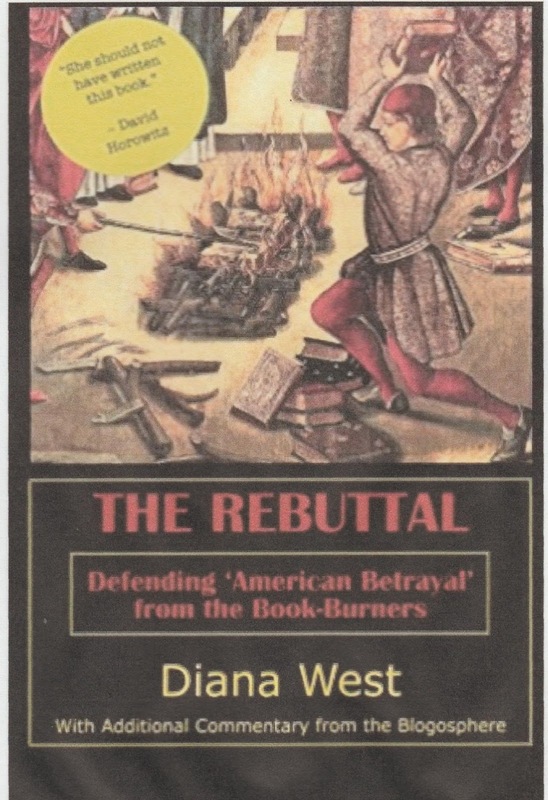 Just as important to read is West’s The Rebuttal: Defending 'American Betrayal' from the Book-Burners, in which she answers virtually all the cowardly smears, mud-slinging, and attempts to discredit her and American Betrayal, which attempts also sorties in character assassinations. It's all here in American Betrayal. Read it at your own risk. If, by the time you finish it, you feel betrayed and duped, given all the lies you have been fed in school and by politicians over your lifetime, lies and “fake news” which you believed to be ironclad verities, then you will know that the title of West’s book is appropriate and supremely justified. 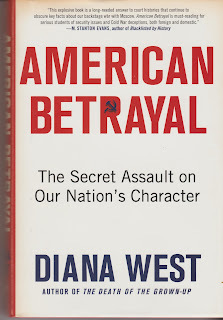 ü *America Betrayal: The Secret Assault on Our Nation’s Character, by Diana West. New York: St. Martin's Press, 2013.
ü **Ayn Rand and Song of Russia: Communism and Anti-Communism in 1940s Hollywood, by Robert Mayhew. Lanham, MD: The Scarecrow Press, 2005. pp. 188-189.